I assume the question is fairly self-explanatory! 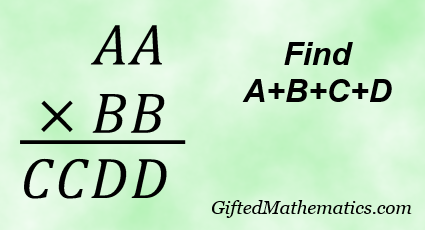 The product of two 2-digit numbers AA and BB is equal to the 4-digit number CCDD, where A, B, C and D are distinct numerals between 1 and 9 inclusive. Pretty simple with an electronic device, but that's not the point - the point is to try it without one! What is a good method that doesn't involve lengthy enumerations of products? If we lift the restriction that A, B, C and D must be different numbers, are there any more solutions? Zeros are still not allowed, though!